This's absolutely amazing! http://together.servitae.org/monday You can't miss it! s/v DANCYN Ranger 32 1974 The luxurious international cruiseing yacht: Total Investment 40K USD! 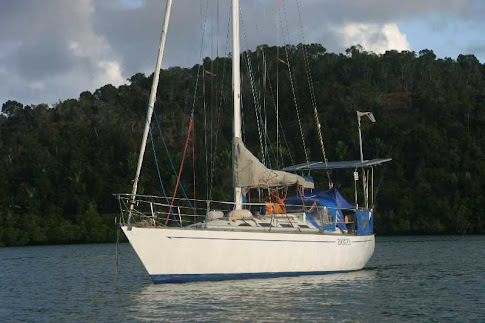 s/v DANCYN Ranger 32 1974 The luxurious international cruiseing yacht: Total investment after 10 years 40K USD! DAN CYN is a combination of Dana and Cynthia the names of the previous owners 2 daughters! She was a clean and working racer. I bought Dancyn in 2000 for 15 thousand dollars in Oceanside California and sailed 6 hrs down to San Diego the following weekend. I fell in love when I saw her flush decks, voluminous interior, subtle tumblehome and beautiful lines! Today Dancyn is still a better boat than I am a sailor after 80,000 miles and 10 years together! Ranger 32's were built in Costa Mesa California. They are one of many in a lineage of plastic classics built in the late 60's through the 70's, which can be acquired for less than 20 thousand USD. These classics were built during a time when focus was given to design and strength not weight reduction. This makes them sturdy cheap "world beaters" easy to find and restore even for a biologist who had never owned a "power tool" or had any real mechanical experience! I choose this Garry Mull design because of a full skeg protecting the rudder and a keel-stepped mast for strength. These 2 points were paramount in my vessel selection at the time. Looking back, "beach a ability" and encapsulated keel construction would factor more into my decision. Ranger 32's have limited storage due to the racing lineage but they due have a voluminous interior. Most of my outfitting involved "making space out of space using mater". In other words building lockers and shelves to enable me to carry the stores, tools and spares to circumnavigate. Dancyn is a modest 9800 pounds and almost half is in the bolt on keel. Her rig is a high aspect 41 feet tall masthead sloop allowing me to keep her on the move even in lighter (typical) conditions. For 6 years I wrestled regularly with my atomic-4, gasoline, 4 cylinder, flat head/side valve inboard engine. I had a love/hate relationship with it but really it was safe and dependable. Back in Australia for the second time I replace it with a Yanmar 20hp Diesel. Night and Day!!! I love my shiny new silver Yanmar and even after 1500hrs it is as dependable as always!! It burns 1/4th the fuel for 20% more speed! Dancyn's slick flush deck caught my eye quicker than a Brazilian bikini! I was drawn in like a teenage boy looking at a muscle car! When I first set eyes on Dancyn I had an unbearable urge to sail her. She reeked of solid performance and that foolishly was what I at 25 years of age thought I wanted for the ultimate road trip! I dislike the Balsa cored deck typical for 70’s construction. Seeping water sponging in is a chronic issue at every deck mounted bolt or small crack. With enough epoxy filler one can easily repair damaged coring. Today, well there is not much balsa left as epoxy filler has replaced it! No boat on the water cruising under 100k sails as well as DANCYN! I regularly out pace larger and heavier boats. I make 140 to 165 mile days offshore. Dancyn’s best mileage in 24hrs is 199 miles sailed between Durban and East London, South Africa and 186 miles leaving the Gulf of Panama heading out to the Galapagos. 21 days from the Galapagos to Fatu Hiva is incredible for a 25 ft water line! I crossed the Atlantic from Cape Town, South Africa to Jacare’ Brazil in 26 days! My Ranger 32 Dancyn and I have spanked out some passages!! Even modern designs do not go to weather as well as Dancyn once the hydraulic aft stay tension is pumped up to 1200 lbs! The only problem is I'm too timid to point that hard!! Dancyn is by far tougher than I am to windward. Back in the day's before my new engine I could punch her up into a bay then drop the hook under sail to the amazement of all the fancy big boat cruisers! Dancyn has always made me look like a better sailor than I am! I still love the sensation of working her up wind into bays and coves! I think she loves it too! The hull and mast have held together in some tough times. I have done 2 rebuilds of the skeg but that was the reef's fault not the construction or designer! I was relieved not to have lost the rudder! The hull/keel joint flexes too much to permanently seal the joint but I have never noticed water leaking in. The annoying line at the seem weighs on my mind more than the hull! She is little light and has a very quick movement underway that wears me out on long trips! In the end I love her but the next time around I am going with something heavier but of the same era and similar design! In all the miles across every ocean on the planet I worried, daily sometimes, but I never doubted her! Grace has saved me plenty of times and I have even saved myself once or twice but mostly..... DANCYN did the majority of the heavy lifting! Thank you designer Gary Mull. She is still a lady even after all the years and all the miles! I will always love DANCYN my Ranger 32.